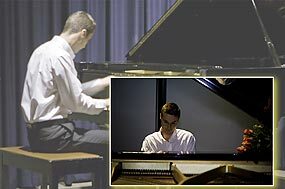 A Virtuoso Recital by Jonas Dept at A.U.A. On the evening of Saturday August 2 at the annual Hillside 4 Charity Party Dinner held at the Amari Rincome Hotel, the recipients of the funds raised by next January’s party will be chosen. The successful charity or charities will be announced in the following week’s Chiang Mai Mail. The focus this year is on smaller organisations with no major sources of funding; this year it is hoped that more than one organisation can be supported. The focus of the fashion show itself is being kept a strict secret by the organisers, but we are assured that the clothes will be spectacular, affordable and suitable for everyone, young and old, of both sexes! The models are all volunteers, and will be showing casual day wear, smart and glamorous evening wear, nightwear and bridal wear. A lovely cocktail dress, (Western size, with alteration included if necessary), will be auctioned, and a fantastic raffle is being planned. and to all the sponsors, as they have been incredibly generous! All profits will go to the Hillside Rooftop Charities—to date, 76,850 baht has been raised and the ultimate aim is a total of well over 1 million. The Charity Party is run entirely by volunteers— everything is donated so there are NO running costs, and every baht raised goes to the charities. Tickets for both events can be purchased at Hillside 4 Condos reception desk, or, please email either Steve on charity [email protected] .com, or Sally on [email protected] csloxinfo.com. The Amari Rincome Dinner costs 500 baht; tickets for the Fashion Show, costing 350baht, will also be available at that event. For his 18 July concert at the A.U.A. , the young Belgian pianist Jonas Dept, (currently teaching at the Santi Music School in Chiang Mai), chose to give us a well constructed and educative ‘mini- history’ of music written for his chosen instrument from its 18th century origins until the impressionist period of the early 20th century. This meant, in effect, a kaleidoscopic view of key figures from Haydn to Ravel – all in an hour or so of vivid music. Inevitably, he chose to begin with Haydn, much of whose keyboard music was written for the harpsichord but whose Sonata No.32, we were assured by his commentator, was actually written for the pianoforte. It was a brilliant and graceful start to the recital and for this listener at least was one of the two highlights of the evening. Jonas Dept enchanting the audience at the A.U.A. The first half of the recital continued with a somewhat bombastic work, Sonata Opus 10, No.3, by Beethoven – giving Dept ample scope for flamboyant playing. This was echoed in the Schumann which followed, making even more extensive use of the keyboard. Immediately after the interval Brahms took us into the late 19th century via an expansive Rhapsody. We were brought into more modern times by a well known work by Debussy, the intriguing and sonorous La Cathedrale Engloutie. Although born less than 30 years after Brahms, the French composer’s impressionist works inhabit a totally different sound world. The mysterious watery world of a submerged cathedral with its bell- like tones was a perfect example of Debussy’s professed attempt ‘to express the inexpressible’. Although Dept has yet to emerge fully from behind his impressive technical skills, he made much of the subtleties of this haunting work. The same was true in a work by Debussy’s great.near-contemporary Ravel whose three-movement Sonatine brought the recital to a sometimes bold and almost passionate conclusion. Dept has promised further performances tracing the history of music for the piano, including those by Prokofiev and other 20th century masters. However his next appearance will be at the Shangri La Hotel in August. Look out for further information in the Mail’s announcement’s page. Jere Lock’s warning -time is running out! Earlier this month, Jere Lock, an outreach coordinator with the Texas Climate Emergency Campaign, (which builds coalitions of farmers, environmentalists, religious communities, labour unions and many others), gave a talk to the Informal Northern Thai Group at Alliance Francaise. About 40 people were in the audience, from all different backgrounds. Jere gave a very informative and interesting talk on the world situation regarding global warming, looking at events both before and after the Kyoto Protocol was signed, as well as looking at the present and the future under a new US administration. He explained that the facts and figures are ‘out there’ with the Intergovernmental Panel on Climate Change, and the 2500 plus UN scientists who won the Nobel prize along with Al Gore, and that they are telling us that we have to make significant CO2 emission cuts no later than 2015 or face catastrophic consequences. He gave his opinion that without a strong US bill and the UN agreement this will not happen. Throughout his talk, he quoted Dr. James Hansen. 20 minutes into his talk, however, it became discussion time; questions and answers with a great deal of participation and interaction between different members of the audience! Marty Bergoffen, a biodiversity attorney living here in Chiang Mai, gave overview of the Climate Justice Conference held recently in Bangkok from July 12 – 14 which was attended by about 140 delegates from all over Asia plus some from Africa, South America, US and Europe. This was followed by Marty and Julia Schonhart, Program Coordinator of the Ecumenical Coalition on Tourism, who spoke about what people can do as individuals and in the political realm. The two plan to spearhead the bringing together of a Chiang Mai group to work on global warming. On June 23, we were confronted with a terrible case. A poor villager had used a flea and tick product on his dogs. This product should be diluted with lots of water and then only sprayed on to dogs’ coats— instead he had injected the highly concentrated insecticide directly into their bodies. One dog had died already and the other four 5-month old puppies and their father, were in a very critical condition. We rushed them to the vet clinic for emergency treatment, necessary because the insecticide had already killed many of their red blood cells. As a result, blood transfusions and various injections were necessary, as was a stay at the clinic for monitoring. Two days later Matt, Mandy, (pictured), and Mary were in stable condition, and Minnie and Mr. HiFi were still on IV, but will hopefully survive. 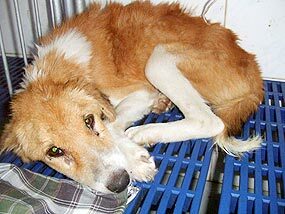 We paid the first vet bill of 15,615 Baht for the 5 dogs. These costs might well add up to a minimum of.20.000 Baht as further blood checks and possibly another blood transfusion for Minnie and Mr.HiFi will be necessary. This is a very large amount for our non-profit rescue organization, but we couldn’t turn a blind eye to them and wanted to give them the chance to survive. The owner can’t afford to pay the vet costs and has agreed that we keep the dogs at our shelter and find new homes for them after recovery.